Rider Spotlight by Susan Dagroo in AdvMoto Dual Sport News Magazine. Incredible experience for me to have met Susan and been her student during the MotoVermont class. MOTORESS® is the only online women's motorcycle magazine of its kind devoted to women motorcycle enthusiasts of all ages and styles. It is such an honor to have my riding stories shared in the worlds most innovated, trusted and respected leader within the women rider segment of the motorcycling industry online magazine. YOUMOTORCYCLE has been an amazing supporter of my rides. He has shared quite a few articles sharing my stories. During my journey to the Panama Canal and back, I had the honor of meeting him in Toronto Canada. He writes a beautiful story about our meeting. He also donated money to help me purchase donuts for my students. Click on the buttons on the left to read the articles. Most recently he interviewed my daughter. I am always honored to be asked to share my motorcycle riding adventures to inspire women riders all over the world. Recently while planning my next ride to Newfoundland, I met Sherrie and she asked if I would share my story. Click on the picture with her tent or the gray button below to read the article. ﻿During my summer 2012 ride to Central America, Arlene followed my journey and provided positive comments on Facebook that helped me stay focused to come home. They have also been very supportive providing apparel as needed for all my motorcycle riding needs. Click on their logo to read the story. Twisted Throttle gave me discounts on a variety of materials for all my rides. They are also sharing my journey with their customers by writing a little entry on their site. How cool are they!!! Click on their logo to read the story. Let the story be told. Who else can share it better than Gypsy Spirits. 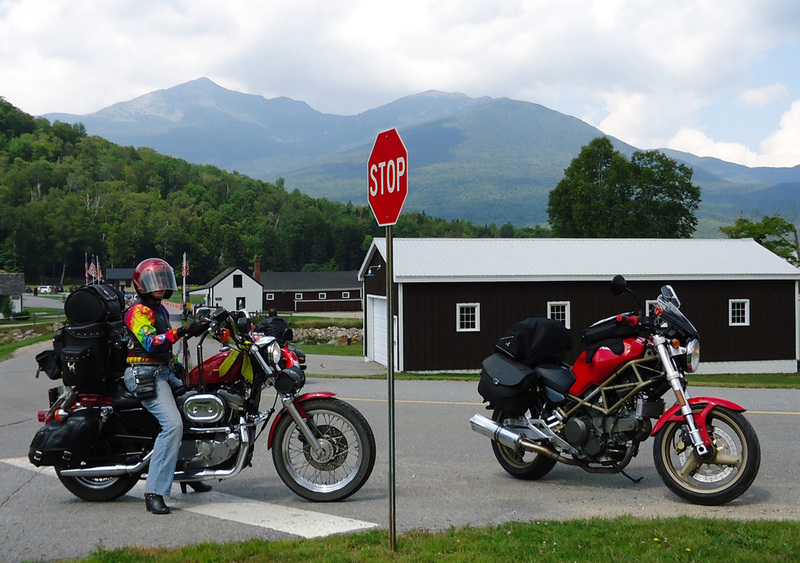 She shares with us how we met, our ride to Mount Washington New Hampshire and best of all, after 12 years of owning by Ducati Monster, she gave him a name, "The Boy". The ride up Mount Washington. 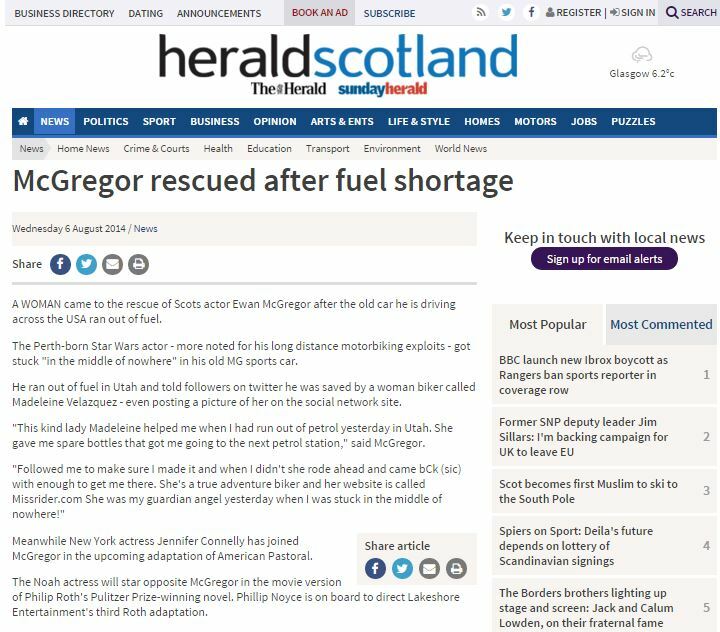 On Wednesday 6 August 2014, they shared the story with their followers with the title, "McGregor rescued after fuel shortage". They wrote, "A WOMAN came to the rescue of Scots actor Ewan McGregor after the old car he is driving across the USA ran out of fuel."